How to Alternate Row Color in Excel? 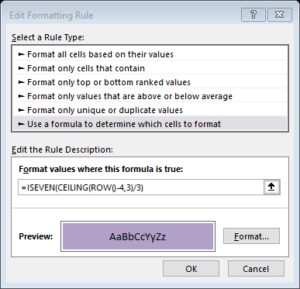 To alternate row color in excel, you can do so by applying conditional formatting, with a combination of functions. 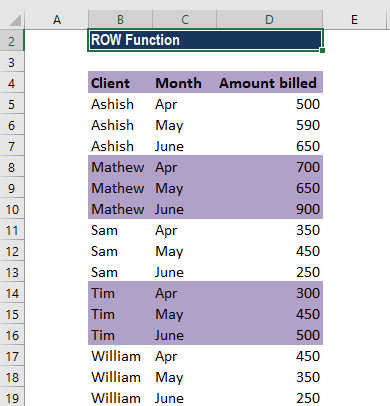 The ROW function is a TEXT function,FunctionsList of the most important Excel functions for financial analysts. This cheat sheet covers 100s of functions that are critical to know as an Excel analyst that will return the first row within a given reference or the number of the current row. If you combine the ROW with the ISODD/ISEVEN and the CEILING function, you can easily alternate the row color of a selected range of cells. Depending on your purpose for alternating row colors, there is a simple way to do it. If you select the range that you desire and then insert a table, this should automatically alternate the row colors, there are multiple table styles that you can select from to fit the style guide that you are looking for. This guide is for a little more complicated, but with a greater room for customization option. In financial analysisAnalysis of Financial StatementsHow to perform Analysis of Financial Statements. This guide will teach you to perform financial statement analysis of the income statement, balance sheet, and cash flow statement including margins, ratios, growth, liquiditiy, leverage, rates of return and profitability. See examples and step-by-step instruction, alternating row color can improve the readability of your spreadsheet. It also facilitates grouping information, such as highlighting alternating groups of n rows. The formula to use would be =ISEVEN(CEILING(ROW()-4,3/3). 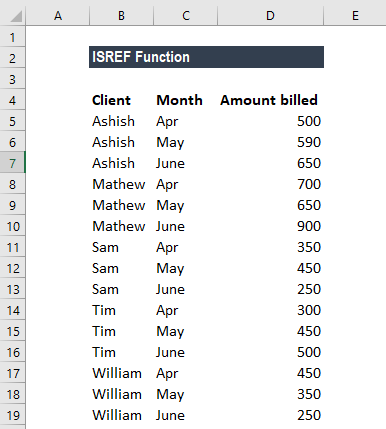 In the formula above, we first “normalize” the row numbers to begin with 1 using the ROW function and an offset. Here, we used an offset of 4. The result goes into the CEILING function, which rounds incoming values up to a given multiple of n. Essentially, the CEILING function counts by a given multiple of n.
The count is then divided by n to count by groups of n, starting with 1. Finally, the ISEVEN function is used to force a TRUE result for all even row groups, which triggers the conditional formatting. Odd row groups return FALSE, so no conditional formatting is applied. We can replace ISEVEN with ISODD to shade rows starting with the first group of n rows, instead of the second. The ROW function uses Reference as an argument. The reference is supposed to be a cell, that the function will retrieve the row value. If you instead leave the argument blank and simply enter =ROW(), the function will return the row of where the function is. So, for example, let’s assume you enter the function =ROW() on cell D22, the function will return 22. If instead, you enter the function =ROW(C7), the function will return the 7. A reference can not refer to multiple areas. Get Your Financial Modeling CertificationFMVA™ CertificationThe Financial Modeling & Valueation Analyst (FMVA)™ accreditation is a global standard for financial analysts that covers finance, accounting, financial modeling, valuation, budgeting, forecasting, presentations, and strategy.